A taxi, without a client in the car or anywhere else in sight, goes around Helsinki’s Senate Square, a place that resonates with history, having seen more patriotism, class struggle, and celebration than any other place in faraway Finland. It stood in for Saint Petersburg many times in American productions, notably during the revolution in Reds and in the cold war cynicisms of The Kremlin Letter—ironic reminders of Finland’s unacknowledged position between West (where we pretend to belong) and East, and of the Slavic melancholy that we possess whether we admit it or not. This quality is caught instinctively by Jim Jarmusch already in the spellbinding establishing shots: snow, smoke signals from an undefined source, images of a place no less a ghost town than was the Memphis of Mystery Train. Diffuse lights are glimpsed from nowhere. Jarmusch has captured admirably the aroma of Chekhovian silences, the Finnish kind—the absolute miserableness of a milieu and its individual stories. It’s the middle of the night. 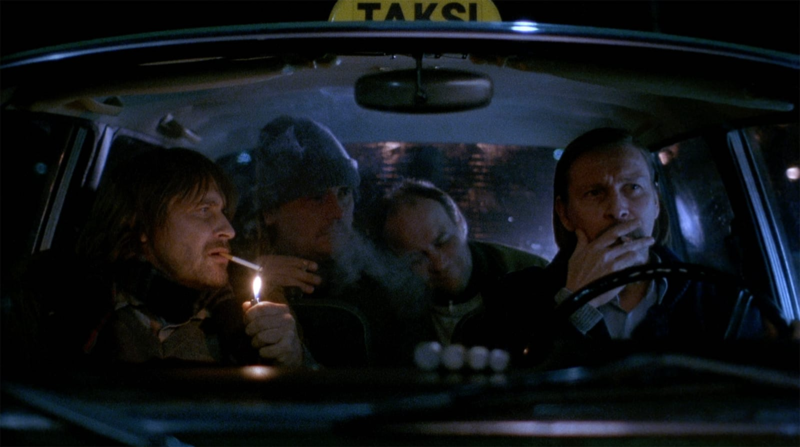 The dead-tired taxi driver’s face belongs to Matti Pellonpää, the great Kaurismäki brothers actor. Eventually, he gets clients—three of them, in a condition that tests his professional obligation to accept anybody—and two more Kaurismäki regulars are now in the picture: Kari Väänänen (who played with Pellonpää in Aki’s La vie de bohème, and who performed all the voices of Winnie the Pooh with Pellonpää on the radio) and Sakari Kuosmanen, a singer in his private life and the lead actor in Aki’s Juha, the “last silent film of the twentieth century.” Yet what follows is by no means a replica of the Kaurismäki world. Jarmusch’s experience of Helsinki is a small miracle to me. He shows us things that no Finnish film has ever thought of, and yet, by a strange intuition, he almost provides a synthesis of the sense of Finnish film and its history. Which, by the way, is not at all as negligible as its lack of international reputation would indicate. For me, Jarmusch is the unmatched modern master of a genre the French call the portmanteau—the episode film. It’s notorious for almost always being chemically devoid of interest, with the exception of auteur films where the episodes remain in the hands of one director, be it Julien Duvivier and Carnet de bal or Max Ophüls with La ronde, to name two extremely strong statements of a worldview. Night on Earth belongs to this rare group. The stories are beautiful, rough and poetic individually, and at the same time their sum total matches the unity of any one-story film. It’s a totally constructed film, but without the slightest schematization, such as we can usually detect in an Altman film, which often presents the same kinds of ambitions. The first three episodes, especially, nobly approach the sense and quality and moral fiber of the finest classic short stories in literature. Jarmusch’s structures are always intriguing and ambitious, as his episodic masterpieces show: Coffee and Cigarettes, or the parallel stories in Mystery Train, where the magic moment of Elvis’s “Blue Moon” mysteriously connects three fields of experience into a wretched and holy sense of common humanity. What impresses me very strongly is his preoccupation with time, space, and duration. As we know, the French compete in the same arena and are in love with the same ideas and concepts. Jarmusch, coming from the country of Faulkner and having absorbed his wisdom, is easily their match. He solves this difficult equation with great lightness, because he is an experimentalist hiding behind an intimate poet with a serious talent for jokes. Peter von Bagh is a Finnish film historian, author, television and radio director and producer, book publisher, and film director. From 1970 to 1985, he was curator and program director of the Finnish Film Archive. Since 1971, he has been the editor in chief of Filmihullumagazine. He is also artistic director and cofounder (with the Kaurismäki brothers) of the Midnight Sun Film Festival, artistic director of Bologna’s Il Cinema Ritrovato festival, and a professor of film history at the Helsinki University of Arts.